Our mini pipes are the perfect size for sneaking a quick smoke break at work or for trying out a new tobacco to see if you like it. They come in a variety of shapes and for the most part, they are all about the same size (see below for details). Each pipe is specially carved Meerschaum formulation made by Royal Meerschaum's own exclusive process used only for making this line of small pipes. Due to the increasing scarcity and cost of raw solid block meerschaum, this line was developed to be affordable by everyone to give you a big-pipe smoke from these little wonders. Each pipe is hand-detailed and inspected for consistency in quality and design and comes with 100% Satisfaction Guarantee. 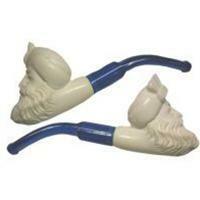 We are proudly carrying mini pipes from Royal Meerschaum and IK Meerschaum. If you are looking for case to protect your mini pipe, we have them here and if you buy it at the same time as your pipe, you can get it at a reduced price.